It’s a crazy time to be a disruption-plus-clock player in Modern. The options seem limitless, even if they also seem to point back at Death’s Shadow. Messing around with Shadow in a Temur Delver deck for the last couple weeks has made me a slobbery wet one, nostalgic for the glory days of 4/4 tramplers and surprising pet cards. More recently, I’ve zoned back in on Temur Delver. This article examines Temur Delver’s perceived strengths and weaknesses in the current metagame, relative to those of Death’s Shadow Jund. Monkey Grow exemplifies what I love about Modern: its endless surprises. It’s packed with efficient spells like Lightning Bolt and Tarmogoyf, and with head-turners like Disrupting Shoal and Simic Charm. It punishes opponents trying to interact as little as possible. The deck also offers a commit-then-disrupt gameplay approach closer to Legacy’s Canadian Threshold than anything else in the format. For a long time, Monkey Grow hovered on the cusp of Modern playability, but gave up too many points against midrange decks to truly shine. With Jund on the decline, the deck’s time may finally be upon us. After the Gitaxian Probe ban, I redesigned the deck completely, abandoning Disrupting Shoal to include a Traverse the Ulvenwald package in the mainboard and finally beat up on the Jund Midrange strategies that had always proved horrible matchups for Temur Delver. While the BGx and URx matchups improved with Traverse, losing Shoal (and Probe) made the deck slightly worse against its natural prey. The Burn matchup became more about opening Goyfs and less about budgeting resources. The Ad Nauseam matchup became more about not drawing Traverse in game one. Monkey Grow still tested favorably against linear decks with Traverse in the main, but losing a percentage here and a percentage there started to add up for me over the course of long events. Frustrated, I turned my focus away from Monkey Grow and towards Colorless Eldrazi Stompy, which has continued to impress me at the competitive level. Then, a new deck catapulted itself to Modern super-stardom: Death’s Shadow Jund. DSJ is in many ways a superior version of the Traverse-featuring Monkey Grow: it’s a clock-plus-disruption strategy that goldfishes kills around the same time and runs the most efficient spells in the format. The deck achieves delirium so blisteringly fast that relying on Traverse as a primary threat, and not just as a recovery back-up plan, becomes both feasible and ideal. To do so, DSJ runs Street Wrath and Mishra’s Bauble, cards that don’t play so nicely with Delver; since threat density is less important with Traverse always active, though, losing Delver doesn’t hurt the deck. There are two other dimensions of Monkey Grow that Death’s Shadow Jund correctly evolves beyond. First, blue countermagic is replaced by black hand disruption. Inquisition of Kozilek and Thoughtseize are much stronger than Stubborn Denial and Mana Leak in terms of efficiency and reliability. Countermagic plays optimally with a turn-one threat, though, while discard incentivizes threats that resolve on turns two through four. Since DSJ runs Goyf and Shadow over Delver and Mandrills, the discard mechanic better synergizes with its threats in addition to boasting generally stronger Magic cards. Second, DSJ shifts gears for grindy games. Monkey Grow has historically relied on Huntmaster of the Fells and Blood Moon to beat midrange and control decks, and has recently moved into Bedlam Reveler and Traverse the Ulvenwald. DSJ can’t run Reveler—it doesn’t play enough instants and sorceries. But its non-Gruul colors give it plenty of gas for longer games. Liliana of the Veil, Liliana, the Last Hope, and Ranger of Eos are all fine grinding options that outlast Huntmaster while also providing utility against aggro decks. DSJ does have one major weakness in comparison to Temur Delver, however: you can’t expect discard into Goyf to get there against strategies that go over the top of fair decks. Tron, Valakut, and Ad Nauseam could care less about Inquisition of Kozilek, and Death’s Shadow’s threats won’t close the game out fast enough to outrace a Karn. Delver strategies address this problem in a few ways: Delver of Secrets, a turn-one threat, applies pressure from the start of the game; Lightning Bolt and company shave turns off the clock; permission, like Leak and Denial, stops Tron and other big-mana decks from actually resolving the bombs they tap out for. DSJ lacks access to these options—it has no turn-one threat, prefers Tarfire to Bolt, and can’t play counterspells. But all is not lost: Temur Battle Rage plugs this hole in Death’s Shadow strategies admirably. If Death’s Shadow Jund already does what Monkey Grow does but better, why return to Monkey Grow at all? There’s something to be said for the Bolt-Shoal-Leak-Denial disruption suite, for starters. While countermagic is less efficient and more conditional than discard in Modern, it still answers things Thoughtseize can only dream of, like Wurmcoil Engine off the top. Modern is full of random decks doing random things, and Mana Leak is a great card to have on-hand when those inevitably come around. I also love Hooting Mandrills‘s positioning right now. Fatal Push doesn’t kill the Ape, and trample gets through Lingering Souls, a common answer to the big grounded beaters Modern has come to revolve around. Finally, the rise of DSJ has led to a steep decline in traditional Jund’s metagame shares. Abzan Midrange has always been easier than Jund for Monkey Grow to beat, as they ramp us into Huntmaster with Path, care more about Moon and Pyroclasm, and lack multipurpose ways to remove Delver of Secrets. On the other hand, Jund is a nightmare for this deck. The Traverse version can beat it, sure. But Monkey Grow’s more general strengths, like the ability to cast Shoal proactively and reactively, are lost to the grindy dumbness of a Traverse build. Without Jund to worry about, we can run a more traditional list with Shoals and tune our sideboard to defeat Death’s Shadow Jund, a far less frightening proposition given how streamlined that deck is. Here’s where I landed for my first draft of the deck. This section explains my choices. Lightning Bolt: Okay, Bolt isn’t what it used to be with Shadow around. After all, toughness-based removal kind of blows against that deck. But going upstairs is no joke, even (especially?) against Death’s Shadow strategies. That goes double in a deck with multiple copies of Snapcaster Mage. Disrupting Shoal: I’ve had some friends dispute Shoal’s worth against Shadow. Doesn’t discard make the card inconsistent? Shadow players can take either Shoal or the blue card we plan to pitch! Perhaps in theory, but not in practice. This build packs a whopping 29 blue cards, so the odds that Shadow can take our single one-drop in the early game are slim. Beyond that, Shoal represents Cancel or Last Word at worst in this matchup. 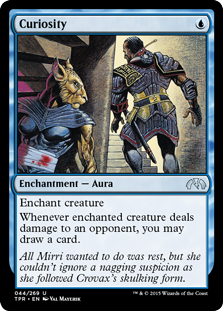 In my experience, it’s often correct for Shadow to strip Shoal from our hand when they see it regardless of our other blue cards, which actually incentivizes us to max out on the counterspell. Still, Shoal sometimes underwhelms against truer midrange decks than Shadow, and for that reason I can see cutting one or two copies for Spell Snare. Simic Charm: Look who else is back! Without Reveler’s pesky condition to worry about, we can afford to run less efficient bounce spells. The utility of hexproof mode is especially relevant in a Fatal Push world, and Giant Growth mode becomes much better when so many Modern players run a set of Goyfs to battle ours with. Sleight of Hand: One-mana sorceries numbers 5 through 6. Necessary for Tarmogoyf, as early-game sorceries allow us to cast Goyf on turn two with no fear of Lightning Bolt. Honestly, I think Sleight is an underrated Modern card. Cantripping is broken. Curiosity: A hedge against linear decks and midrange. We miss Probe against the former, and Traverse against the latter. Curiosity is also very good with Disrupting Shoal, and I swore by a pair of the enchantment in my early builds of the deck. Tarfire: I’m big on big Goyfs. It’s crucial to hit 5/6 against creatures like Tasigur and Smasher. Dismember: A hedge against Eldrazi. The one copy can also nab a Goyf or Shadow against off-guard DSJ players in the early game. Without four copies of Gitaxian Probe, it becomes easier to budget our life around Dismember. Huntmaster of the Fells: Reveler left so much to be desired against go-wide aggro strategies like Merfolk that I ended up even running Huntmaster in the Traverse build. Hunt’s also superb against Eldrazi, where he guns down dorks and Skyspawners during topdeck wars (er, topdeck-another-Brushland wars) and generates blockers. Engineered Explosives: Incredibly flexible and enables blowouts. Very strong against DSJ, and lets us run fewer artifact/enchantment-removal cards. Threads of Disloyalty: A more direct hedge against DSJ. I liked Threads there when I drew it in Temur Shadow, but not so much when I opened it, as it would just get discarded. Running two makes it more reliable, and I think we have room for both. If I had to sleeve up Delver of Secrets at a competitive event, I would strongly consider a Temur Delver build similar to the one in this article. Of course, I won’t have to; Colorless Eldrazi Stompy’s plenty good right now, despite having lost some great matchups in Jund and Infect to format shifts. Still, Jund becoming DSJ bodes well for Monkey lovers jungle-wide, and I’m excited to see if my testing yields an upkeep-trigger-transform deck I can back with my usual baboonian confidence. Do you think Curiosity works in a shoalless build? Odd question, but it seems committing 2 mana to a delver that eats bolt seems bad without some sort of backup. I really don’t. We need as many ways as possible to protect the threat we suit up with Curiosity, and it helps that Curi pitches to Shoal itself when we need it to. In Bolt matchups, it’s generally best to save Curi for Mandrills or Goyf; in linear matchups like Tron, though, dropping it on our first threat is fine. what’s your opinion​ of grixis​ delver? A midrange deck with a cheap threat with which to cheese wins against Tron, AN, Burn, and other linear strategies. Grixis Delver is inconsistent when it comes to sticking an early threat in the early turns in that kind of matchup, making it a worse Temur Delver there and a worse Grixis Control against fair decks. But it’s obviously better at adopting the midrange role than we are, since it’s built like a midrange deck. Overall: competent but unfocused, and not superb at any one thing.